Not your typical Cold Pressed juice and coffee shop, GI Juice & Java is Women and Veteran owned. 100% RAW juice made by our GoodNature X1 Cold Press Machine, the leaders in the cold press industry. By offering a unique line of locally-sourced products, we strive to serve our neighbors with the freshest organic and local organically grown fruits, vegetables, and coffee in Bucks County. Join us for our signature juices, smoothies and coffee along with organic salads from Blue Moon Acres with our homemade dressings. We offer a wide variety of Organic superfoods including E3Live Blue Green Algae’s, Four Sigmatic Mushroom Elixers, Goldenmilk, Matcha (mixed by hand), Chaga Ice Teas, CBD infused bottled water and a full line of Full Spectrum CBD products. 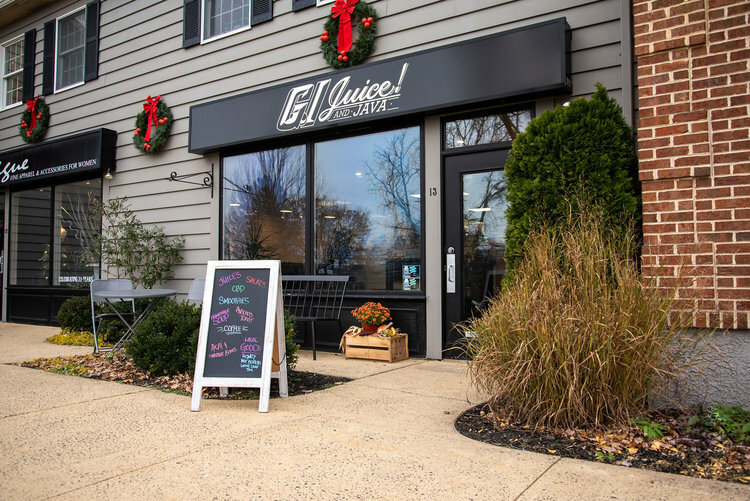 If you’re looking for the best fully organic juice bar and coffee in Bucks County then look no further than GI Juice & Java. We’re located right in the heart of Lahaska just a short drive away from Doylestown, Buckingham, and New Hope, PA. We source all of our products locally from Bucks County so that we can use only the best of the best organic produce and ingredients free from preservatives. Our product lineup includes raw juice pressed right here on site in Lahaska, fresh fruit smoothies made from organic fruit, savory coffee pressed from organic coffee beans free from GMOs, and incredible organic salads from Blue Moon Acres with our homemade dressings. Not only do our smoothies taste incredible and will leave your refreshed but we incorporate superfoods into them because the whole point of smoothies is to be healthy right? You won’t find a better healthy food in Doylestown! All cups, lids, straws, containers and utensils are compostable. We are currently working with a supplier to develop our own compostable juice bottles as glass bottles also end up in landfills. 2019 will bring a commercial compost pickup at the store so feel free to leave or bring back your used items so they can be disposed of properly. We are striving for a zero waste store so please be mindful of our goal. Smoothie cups have a sip lid so you can forgo the straw! Our food waste goes to our backyard chickens and our neighbors’ pigs. Our mission it to provide the highest quality healthy drinks and shakes that are ACTUALLY going to benefit your health. Incorporating superfoods as well as using only locally sourced organic ingredients from ensures our fruit smoothies and healthy drinks will taste amazing not only because they’re made from the freshest ingredients in the Bucks County area, but because they’re free from the stuff that shouldn’t be in there in the first place. We’re not only passionate about helping you eat cleaner but leaving a cleaner carbon footprint as well. All of our cups, lids, and utensils are 100% compostable. We’re finding every way to make sure that our store generates zero waste. All though are materials are compostable we still encourage you to bring your own coffee mug and cups for juice and smoothies and we’ll give you a discount for being eco-friendly! Feel free to bring your own cup for coffee, on demand juices and smoothies! We will give you a $.20 discount for each unused cup and lid! Extended Hours coming this Spring!